Prince Lionheart believes that everyone deserves a seat at the table, which is why it makes booster seats that can belly up to the table as soon as Baby is able to self-support her head. 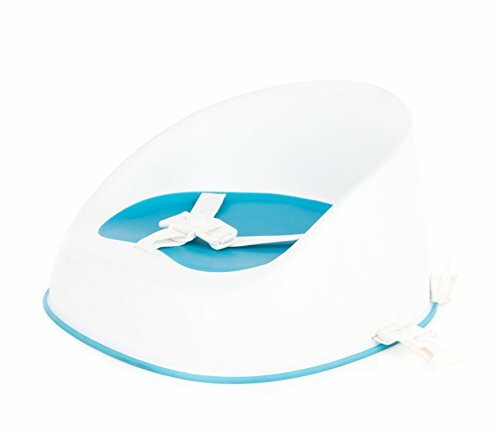 We designed this booster seat for young toddlers (18m+) so they can safely and comfortably join the family at the dinner table and start mastering the skills of self-feeding and table manners. This seat has comfort and security built in with a suspended seating area for comfort - it's not just rubber or foam on a rigid base, but actually has a comfy spring to it, a rigid base for stability, slip-resistant feet for safety, and three sets of straps to keep the seat on the dining chair and the squirmy diner in the seat! Lightweight and portable, this seat is ideal for use at home or on-the-go and is intended for children 18m+ who are able to sit up unaided and up to 5 years old or a maximum weight of 60lbs, though all of us at Prince Lionheart wish we made them in adult sizes! Three-point harness and dual-strap system for the chair-a fancy way of saying this is one safe seat. Easy to wipe clean, waterproof and lightweight for ease of travel. Slip and scratch-resistant to protect furniture. If you have any questions about this product by Prince Lionheart, contact us by completing and submitting the form below. If you are looking for a specif part number, please include it with your message.